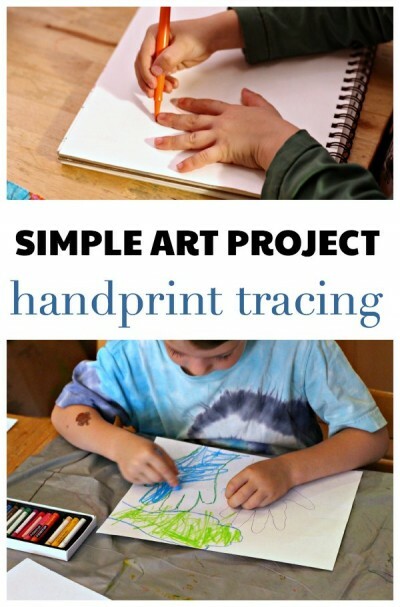 I continue to try and find small, simple ways to encourage my 5 year old to try easy art projects, even though he has declared he “hates art.” As I promised, in my last post about our easy tape art activity, I’m sharing them here with you. 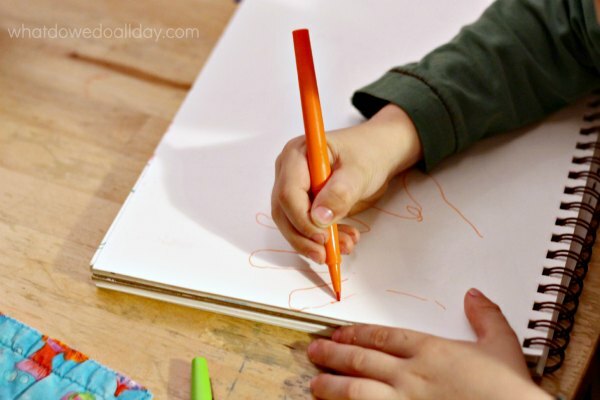 At the end of this post I’ve listed a few ideas how kids who LOVE art can take it to the next level. For those of you with kids who are art resistant, I’m right with you! The handprint tracing idea originally came about because I wanted the boys to write thank you notes to their mormor (aka grandmother). My 9 year old sat right down, but his brother protested. On a whim I offered to trace his hands, an idea he loved. 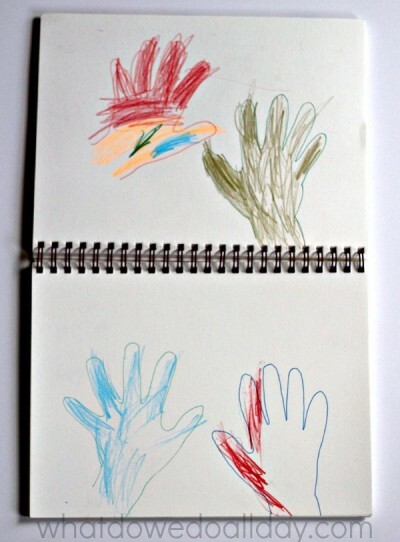 Thus relieved of the stress of drawing (he has fine motor delays, which partially account for his reluctance to draw) he colored in the hands with abandon. A few weeks later I was working in my art journal and strategically left his journal next to me, open to a blank page. As he watched me I offered to trace his hand. He agreed and after three pages of hand tracing I got up to tend to something else. 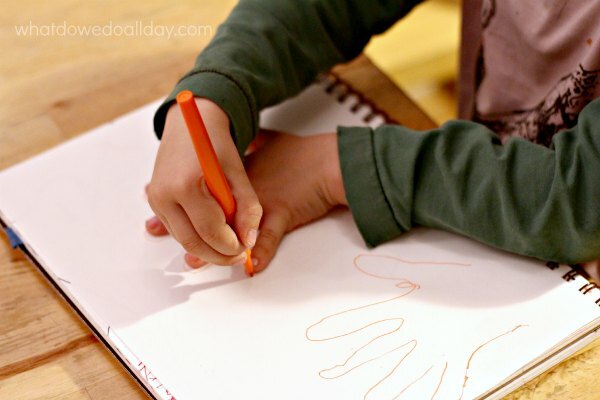 When I returned I discovered him tracing his own hands. I was quite delighted, especially when he was so carefully filling in the broken line! All of this lasted about 15 minutes, which is quite a long time in New Kid Art Time! I realize this art project may not be revolutionary or amazing, but it might just spark a latent interest in your child’s creative mind. Plus, once you have done a few hand outlines, you can move on to the full body! Color in hand with designs, perhaps even in the style of zentangles. 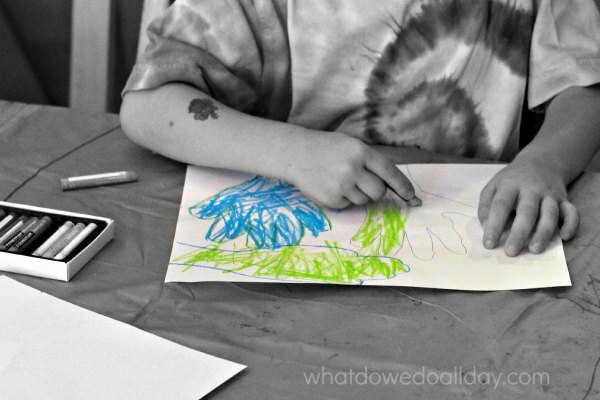 Trace hands with oil pastels and experiment with watercolor resist. Turn handprints into an optical illusion.